Pitch in to help the County Employees’ Charitable Organization! 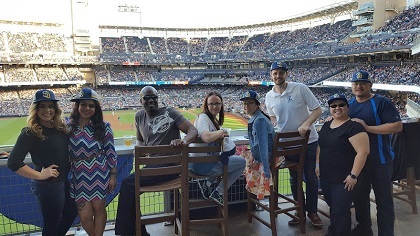 Buy tickets to CECO’s second annual fun-raiser at Petco Park on May 20 when the Padres take on the Diamondbacks. A portion of every ticket sold will go directly back to the nonprofit, which has served as the charitable arm of the County of San Diego since 1956. Discounted tickets are available to County employees and their family and friends. Tickets are $30 for field pavilion level, $40 for field box level and $75 for unlimited food and beverage/beer in The Landing. Plus, the Padres are giving away a fedora to each ticketholder at the game. So gather up a group and get ready to root, root, root for the home team. The event is sure to be a hit. Head over to the online box office now. Ticket sales close at 11:59 p.m., May 8. For more information, please contact Detra Williams at detra.williams@sdcounty.ca.gov.